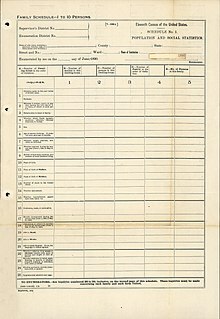 The Eleventh United States Census was taken beginning June 2, 1890. It determined the resident population of the United States to be 62,979,766—an increase of 25.5 percent over the 50,189,209 persons enumerated during the 1880 census. The data was tabulated by machine for the first time. The data reported that the distribution of the population had resulted in the disappearance of the American frontier. Most of the 1890 census materials were destroyed in a 1921 fire and fragments of the US census population schedule exist only for the states of Alabama, Georgia, Illinois, Minnesota, New Jersey, New York, North Carolina, Ohio, South Dakota, and Texas, and the District of Columbia. The United States Census is a decennial census mandated by Article I, Section 2 of the United States Constitution, which states: "Representatives and direct Taxes shall be apportioned among the several States ... according to their respective Numbers .... The actual Enumeration shall be made within three Years after the first meeting of the Congress of the United States, and within every subsequent Term of ten Years." Section 2 of the 14th Amendment states: "Representatives shall be apportioned among the several States according to their respective numbers, counting the whole number of persons in each State, excluding Indians not taxed." The United States Census Bureau is responsible for the United States Census. The Bureau of the Census is part of the United States Department of Commerce. The United States Census of 1880 conducted by the Census Bureau during June 1880 was the tenth United States Census. It was the first time that women were permitted to be enumerators. The Superintendent of the Census was Francis Amasa Walker. This was the first census in which a city – New York – recorded a population of over one million. The American frontier comprises the geography, history, folklore, and cultural expression of life in the forward wave of American expansion that began with English colonial settlements in the early 17th century and ended with the admission of the last mainland territories as states in 1912. A "frontier" is a zone of contact at the edge of a line of settlement. The leading theorist Frederick Jackson Turner went deeper, arguing the frontier was a process that transformed people and turned Europeans into Americans, "The frontier," he asserted, "promoted the formation of a composite nationality for the American people." He theorized it was a process of development: "This perennial rebirth, this fluidity of American life, this expansion westward...furnish the forces dominating American character." Turner's ideas since 1893 have inspired generations of historians to explore multiple frontiers. However the popular folk frontier concentrates on the conquest and settlement of Native American lands west of the Mississippi River, in what is now the Midwest, Texas, the Great Plains, the Rocky Mountains, the Southwest, and the West Coast. This was the first census in which a majority of states recorded populations of over one million, as well as the first in which multiple cities – New York as of 1880, Chicago, and Philadelphia – recorded populations of over one million. The census also saw Chicago rank as the nation's second-most populous city, a position it would hold until 1990, in which Los Angeles (currently 57th) would supplant it. The City of New York, usually called either New York City (NYC) or simply New York (NY), is the most populous city in the United States and thus also in the state of New York. With an estimated 2017 population of 8,622,698 distributed over a land area of about 302.6 square miles (784 km2), New York is also the most densely populated major city in the United States. Located at the southern tip of the state of New York, the city is the center of the New York metropolitan area, the largest metropolitan area in the world by urban landmass and one of the world's most populous megacities, with an estimated 20,320,876 people in its 2017 Metropolitan Statistical Area and 23,876,155 residents in its Combined Statistical Area. A global power city, New York City has been described as the cultural, financial, and media capital of the world, and exerts a significant impact upon commerce, entertainment, research, technology, education, politics, tourism, art, fashion, and sports. The city's fast pace has inspired the term New York minute. Home to the headquarters of the United Nations, New York is an important center for international diplomacy. Chicago, officially the City of Chicago, is the most populous city in Illinois and the third most populous city in the United States. As of the 2017 census-estimate, it has a population of 2,716,450, which makes it the most populous city in the Midwestern United States. Chicago is the county seat of Cook County, the second most populous county in the United States, and the principal city of the Chicago metropolitan area, which is often referred to as "Chicagoland." The Chicago metropolitan area, at nearly 10 million people, is the third-largest in the United States, the fourth largest in North America, and the third largest metropolitan area in the world by land area. During the American Civil War (1861–1865), the Union, also known as the North, referred to the United States of America and specifically to the national government of President Abraham Lincoln and the 20 free states, as well as 4 border and slave states that supported it. The Union was opposed by 11 southern slave states that formed the Confederate States of America, also known as "the Confederacy" or "the South". The Confederate States of America, commonly referred to as the Confederacy and the South, was an unrecognized country in North America that existed from 1861 to 1865. The Confederacy was originally formed by seven secessionist slave-holding states—South Carolina, Mississippi, Florida, Alabama, Georgia, Louisiana, and Texas—in the Lower South region of the United States, whose economy was heavily dependent upon agriculture, particularly cotton, and a plantation system that relied upon the labor of African-American slaves. 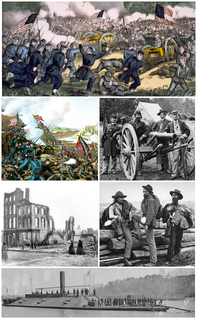 The American Civil War was a war fought in the United States from 1861 to 1865, between the North and the South. The Civil War is the most studied and written about episode in U.S. history. Primarily as a result of the long-standing controversy over the enslavement of black people, war broke out in April 1861 when secessionist forces attacked Fort Sumter in South Carolina shortly after Abraham Lincoln had been inaugurated as the President of the United States. The loyalists of the Union in the North proclaimed support for the Constitution. They faced secessionists of the Confederate States in the South, who advocated for states' rights to uphold slavery. Herman Hollerith was an American inventor who developed an electromechanical punched card tabulator to assist in summarizing information and, later, accounting. He was the founder of the Tabulating Machine Company that was amalgamated in 1911 with three other companies to form a fifth company, the Computing-Tabulating-Recording Company, which was renamed IBM in 1924. Hollerith is regarded as one of the seminal figures in the development of data processing. His invention of the punched card tabulating machine marks the beginning of the era of semiautomatic data processing systems, and his concept dominated that landscape for nearly a century. The tabulating machine was an electromechanical machine designed to assist in summarizing information stored on punched cards. Invented by Herman Hollerith, the machine was developed to help process data for the 1890 U.S. Census. Later models were widely used for business applications such as accounting and inventory control. It spawned a class of machines, known as unit record equipment, and the data processing industry. The United States Census Bureau is a principal agency of the U.S. Federal Statistical System, responsible for producing data about the American people and economy. 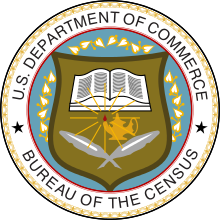 The Census Bureau is part of the U.S. Department of Commerce and its director is appointed by the President of the United States. Native Americans, also known as American Indians, Indigenous Americans and other terms, are the indigenous peoples of the United States, except Hawaii. There are over 500 federally recognized tribes within the US, about half of which are associated with Indian reservations. The term "American Indian" excludes Native Hawaiians and some Alaska Natives, while Native Americans are American Indians, plus Alaska Natives of all ethnicities. Native Hawaiians are not counted as Native Americans by the US Census, instead being included in the Census grouping of "Native Hawaiian and other Pacific Islander". The United States Census of 1850 was the seventh census of the United States. Conducted by the Census Office on June 1, 1850, it determined the resident population of the United States to be 23,191,876—an increase of 35.9 percent over the 17,069,453 persons enumerated during the 1840 Census. The total population included 3,204,313 slaves. Few sets of microdata from the 1890 census survive,  but aggregate data for small areas, together with compatible cartographic boundary files, can be downloaded from the National Historical Geographic Information System. A punched card or punch card is a piece of stiff paper that can be used to contain digital data represented by the presence or absence of holes in predefined positions. Digital data can be used for data processing applications or, in earlier examples, used to directly control automated machinery. Data processing is, generally, "the collection and manipulation of items of data to produce meaningful information." In this sense it can be considered a subset of information processing, "the change (processing) of information in any manner detectable by an observer." The Twenty-second United States Census, known as Census 2000 and conducted by the Census Bureau, determined the resident population of the United States on April 1, 2000, to be 281,421,906, an increase of 13.2% over the 248,709,873 people enumerated during the 1990 Census. This was the twenty-second federal census and was at the time the largest civilly administered peacetime effort in the United States. The Powers Accounting Machine was an information processing device developed in the early 20th century for the U.S. Census Bureau. It was then produced and marketed by the Powers Accounting Machine Company, an information technology company founded by the machine's developer. The company thrived in the early 20th century as a producer of tabulating machines. It was a predecessor to the current Unisys corporation. Starting at the end of the nineteenth century, well before the advent of electronic computers, data processing was performed using electromechanical machines called unit record equipment, electric accounting machines (EAM) or tabulating machines. Unit record machines came to be as ubiquitous in industry and government in the first two-thirds of the twentieth century as computers became in the last third. They allowed large volume, sophisticated data-processing tasks to be accomplished before electronic computers were invented and while they were still in their infancy. This data processing was accomplished by processing punched cards through various unit record machines in a carefully choreographed progression. This progression, or flow, from machine to machine was often planned and documented with detailed flowcharts that used standardized symbols for documents and the various machine functions. All but the earliest machines had high-speed mechanical feeders to process cards at rates from around 100 to 2,000 per minute, sensing punched holes with mechanical, electrical, or, later, optical sensors. The operation of many machines was directed by the use of a removable plugboard, control panel, or connection box. Initially all machines were manual or electromechanical. The first use of an electronic component was in 1937 when a photocell was used in a Social Security bill-feed machine. Electronic components were used on other machines beginning in the late 1940s. The Twentieth United States Census, conducted by the Census Bureau, determined the resident population of the United States to be 226,545,805, an increase of 11.4 percent over the 203,184,772 persons enumerated during the 1970 Census. It was the first census in which a state – California – recorded a population of 20 million people, as well as the first in which all states recorded populations of over 400,000. The United States Census of 1860 was the eighth Census conducted in the United States starting June 1, 1860, and lasting five months. It determined the population of the United States to be 31,443,321, an increase of 35.4 percent over the 23,191,875 persons enumerated during the 1850 Census. The total population included 3,953,761 slaves. The United States Census of 1870 was the ninth United States Census. Conducted by the Census Bureau in June 1870, the 1870 Census was the first census to provide detailed information on the black population, only years after the culmination of the Civil War when slaves were granted freedom. The population was said to be 38,555,983 individuals, a 22.62% increase since 1860. The 1870 Census' population estimate is controversial, as many believed it underestimated the true population numbers, especially in New York and Pennsylvania. The Twelfth United States Census, conducted by the Census Office on June 1, 1900, determined the resident population of the United States to be 76,212,168, an increase of 21.0 percent over the 62,979,766 persons enumerated during the 1890 Census. The Thirteenth United States Census, conducted by the Census Bureau on April 15, 1910, determined the resident population of the United States to be 92,228,496, an increase of 21.0 percent over the 76,212,168 persons enumerated during the 1900 Census. The 1910 Census switched from a portrait page orientation to a landscape orientation. The Fourteenth United States Census, conducted by the Census Bureau one month from January 5, 1920, determined the resident population of the United States to be 106,021,537, an increase of 15.0 percent over the 92,228,496 persons enumerated during the 1910 Census. James Legrand Powers was a US inventor and entrepreneur, the founder of Powers Accounting Machine Company. ↑ "Library Bibliography Bulletin 88, New York State Census Records, 1790-1925". New York State Library. October 1981. pp. 44 (p. 50 of PDF). Archived from the original on January 30, 2009. Retrieved December 15, 2008. ↑ Truesdell, Leon E. (1965). The Development of Punch Card Tabulation in the Bureau of the Census: 1890-1940. US GPO. ↑ "Population and Area (Historical Censuses)" (PDF). United States Census Bureau. Archived (PDF) from the original on June 24, 2008. Retrieved June 20, 2008. ↑ Austrian, Geoffrey D. (1982). Herman Hollerith: Forgotten Giant of Information Processing. New York: Columbia University Press. pp. 85–86. ISBN 0-231-05146-8. ↑ Dippie, Brian W. (1982). The Vanishing American: White Attitudes and U.S. Indian Policy. Middleton, CT: Wesleyan University Press. p. ??. ISBN 0-8195-5056-6. The data yielded by this census provided strong evidence that the United States' policies towards Native Americans had had a significant impact on the enumeration of the census in the second half of the 19th century. US domestic policy combined with wars, genocide, famine, disease, a declining birthrate, and exogamy (with the children of biracial families declaring themselves to be white rather than Indian) accounted for the decrease in the enumeration of the census. Chalk, Frank; Jonassohn, Kurt (1990). The History and Sociology of Genocide: Analyses and Case Studies. New Haven: Yale University Press. ISBN 0-300-04446-1. ↑ Porter, Robert; Gannett, Henry; Hunt, William (1895). "Progress of the Nation", in "Report on Population of the United States at the Eleventh Census: 1890, Part 1". Bureau of the Census. pp. xviii–xxxiv. ↑ Turner, Frederick Jackson (1969). The Early Writings of Frederick Jackson Turner Compiled by Everett E. Edwards. Freeport, NY: Books for Libraries Press. ↑ Blake, Kellee (Spring 1996). "First in the Path of the Firemen: The Fate of the 1890 Population Census, Part 1". Prologue Magazine . Washington, DC: National Archives and Records Administration. ISSN 0033-1031. OCLC 321015582 . Retrieved April 13, 2013. ↑ Blake, Kellee (Spring 1996). "First in the Path of the Firemen: The Fate of the 1890 Population Census, Part 3". Prologue Magazine . Washington, DC: National Archives and Records Administration. ISSN 0033-1031. OCLC 321015582 . Retrieved April 13, 2013. ↑ US Census Bureau, Census History Staff. "Availability of 1890 Census - History - U.S. Census Bureau". www.census.gov. Retrieved 2017-03-28. ↑ The District of Columbia is not a state but was created with the passage of the Residence Act of 1790. ↑ "Regions and Divisions". U.S. Census Bureau. Archived from the original on December 3, 2016. Retrieved September 9, 2016.